← La Transjurassienne is saved. For its fortieth anniversary, König Ludwig Lauf had done things well. 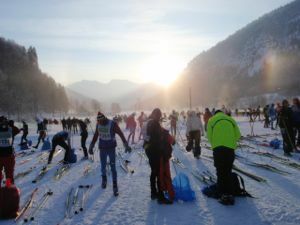 Meticulous organization, program translates in all the languages of Worldloppet, route which visits the castle of König Ludwig, the soft and plentiful snow. Well, it was not compulsory to order the intense cold which we knew 40 years ago, during the first editions of the König! -22 ° Celsius, a small North wind and an overcast weather on Saturdays for skating 50 km. Felt weather report: – 29 ° Celsius. The traders of thermal underwear, gloves Wind-stopper and the other cowls sold their stocks. More than 600 skiers on the big distance and about 500 on the 23km. On the era of departure, the sun made its appearance only at about 9:00 am: regrettably the organizers had not delayed the departure and it is on an icy plain that we had to wait the departure time. No tents, nothing to protect itself. The initial route having been slightly modified, the 50 km having risen pleasantly to the castle redid a small buckle of 10 km near the departure. For reasons which doubtless hold some security, this second buckle was very early closed (at around midday, while the cut time was announced 10 km earlier at 1:30 pm). Result near half of the competitors, who had quietly defied intense cold, were not authorized to buckle 50 km and were automatic sent back on the arrival reached finally at the end afterf 40 km. Our friends come from a great distance (of Australia or the USA in particular) were very disappointed. As far as they made a little more warmly and as far as nothing in their physical state justified this premature stop. It is all the more it’s a pity that all the rest was completed: tracks, food stations, signaling system. Bravo to the volunteers who held (by – 22 ° C and without moving a lot) the food stations. All in all near half of the competitors were not classified. 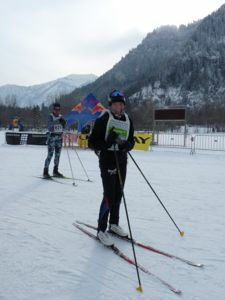 France : Boris PETROFF : 3h50 (50 km) et Isabelle PETROFF : 4h21 (40 km). Christian VIRY : 4h57 (40 km). 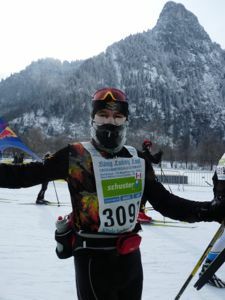 France : Boris PETROFF : 4.15 ; Hervé COURTINE : 1h39 (23 km). WL has announced that all racers that completed the 40km course on Saturday will get a gold stamp in their passport.